Do you remember when grunge compatriots Alice in Chains were the opening band for the Clash of the Titans Tour, featuring Slayer, Megadeth and Anthrax? The year was 1990 and Alice In Chains were less than embraced by the hordes of thrash metal maniacs. In fact, there were verbal assaults backed up by some physical antics by the crowd. It was projectile city. Well, they proved us all wrong by going on to sell a bajillion records, and now after finally starting to work on a new album, the quartet have signed on with EMI's Virgin Records. 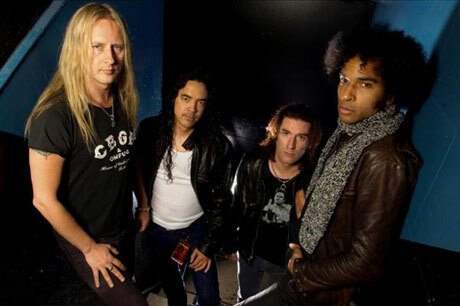 No specific date has been set for release of the group's fourth proper studio album, though Alice in Chains have hinted around mid-September. It is still unnamed at present as well. Recorded with producer Nic Raskulinecz (Foo Fighters, Rush) in California, it features singer William DuVall - who replaced original singer Layne Staley in 2005 after Staley's death by overdose, circa 2002 - bassist Mike Inez, drummer Sean Kinney and guitarist Jerry Cantrell. "It's been a meaningful journey and a hell of a story," says Cantrell in a statement. "We're very excited to have a home at Virgin/EMI and are looking forward to writing new chapters in the book of Alice."